← THE CATHOLIC CHURCH IN FRANCE HAS JOINED THE CATHOLIC CHURCH IN GERMANY AND THE REST OF WESTERN EUROPE IN SLIDING DOWN THE SLIPPERY SLOPE TO SODOM AND GOMORRAH. TRUTH? WHAT IS TRUTH? IN THE CASE OF THE CHILEAN VISIT IT IS HARD TO RECOGNIZE THE TRUTH, WHICH IS CHRIST. There were two explosive subjects of the press conference, both localized in Chile: the fate of the bishop of Osorno, Juan de la Cruz Barros Madrid, and the lightning wedding celebrated by the pope between a hostess and a steward, during the flight from Santiago to Iquique. 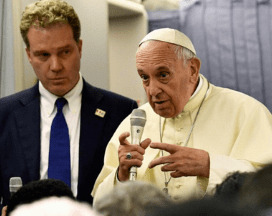 In Chile, responding curtly to a question from a journalist, Francis had spoken not of missing “evidence,” but of “proofs.” And for the use of this latter word – in reality little or not at all different from the former – he apologized on the airplane. He held firm, however, to the correctness of the word “calumny” as he applied it to those who say they are victims of sexual abuse that the pope maintains never happened. He also said, however, that he had never listened to the “victims” because they neither “came to” nor “were presented to” him. When in reality they asked over and over again, publicly, for the pope to listen to them so that he could verify on the basis of their testimony precisely that “evidence” which he continues to say is missing. During the flight back from Rome, Francis also furnished a new exegesis of the letter he wrote to the Chilean bishops on January 31, 2015, made public by the “Associated Press” just before this journey to Chile. From how the letter was written, in fact, it seemed to be clear that Pope Francis himself thought it was right, until the end of 2014, to remove this bishop, only to change his view and promote him, on January 10 of 2015, to the see of Osorno. In this tangle of contradictions, it remains unexplained why the victims of the spiritual guide of the bishop of Osorno, the priest Antonio Karadima, should have been given the greatest credence, arriving rapidly at the canonical sentence of condemnation, while some of these same victims are instead not given credence and not even listened to when they accuse the bishop. During the inflight press conference, Francis also said that he had “thanked” Cardinal Sean O’Malley, head of the pontifical commission for the protection of minors, for the words he had spoken on the question. In reality, the statement that the cardinal published on January 20 on the website of his archdiocese of Boston is anything but in harmony with the pope. And even Francis – according to what he said during the flight to Rome – seems to have been taken by surprise by the idea of marrying the hostess and the steward, but decided to proceed on the spot, giving immediate credence to the two.